Almost every weekend, Social Media Specialist (and fitness fanatic) and fellow Team Beachbody Coach Amanda preps her meals and shares her photos on her Instagram account. Her simple photos remind us meal prep doesn’t have to be hard. This week she is following the portion plan for 21 Day Fix EXTREME. In order to maintain her weight, she falls in the 1,800-2,099 calorie bracket. Of course, it’s not necessary to prepare this much food at once, but Amanda does it to save herself time later in the week. If you do your meal planning on Sunday, save these for next week! 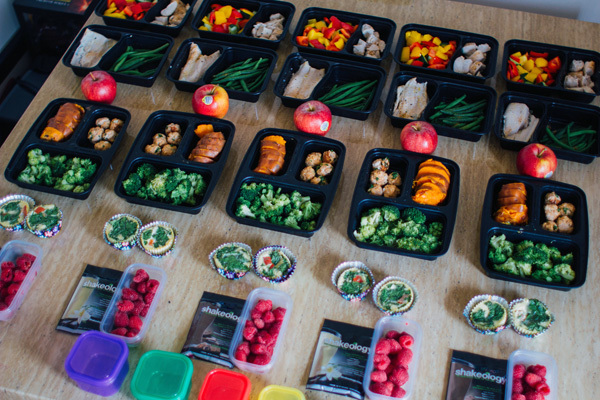 If you have any questions about meal prep – or 21 Day Fix EXTREME –shoot me an email at info@fitfluentialmom.com!